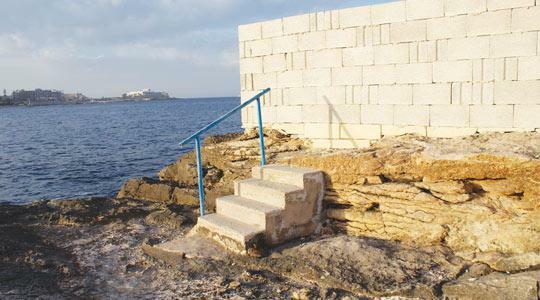 A seven-course perimeter wall around the waterpolo pitch at Exiles has drastically altered public access along the Sliema coastline. A storm has blown up at the popular Sliema bathing spot and scenic attraction on the southeast tip of St Julian’s Bay. The upholding of the Structure Plan policy on visual integrity do not stand a sporting chance as Exiles Waterpolo Club premises is set to expand. The name of this rocky beach could have come from a shortened reference to a Customs and Excise office once stationed in the bay. Another version is that it was called after exiled Russians who fled the Bolshevik revolution and settled in the area, becoming frequent users of the rocky shore. For as long as anyone can remember there was a small hut at Exiles, originally owned by the ‘Malta Eastern Club’. It was an exclusive clubhouse reserved for Maltese and expat employees of Cable and Wireless, the British telephone company based in St Julian’s. The club dated from colonial times and was named after a company merger in 1872 between Malta, Algiers and Marseilles formed the Eastern Telegraph Company. Twenty odd years ago, the Works Department of the day submitted an application to the planning and permits board that existed prior to the setting up of the Malta Environment and Planning Authority. Permission to build small premises was granted on the express condition that the height of the building was not to exceed one floor. That’s enough of history; now more about how quickly the view at Exiles is threatening to change from one day to the next. People who almost daily, according to season, enjoy walking or swimming along this open shore, reported last week that a brick wall 10 courses high had suddenly been built in the car park. Until two weeks ago, at this same spot, elderly people used to sit gazing out to sea in their cars, enjoying the scenery in all kinds of weather. It has been rumoured that the wall, which has also sealed off a public footpath, could be a ‘hoarding’ or temporary wall to contain operations during the demolition of the existing premises used by the Exiles Waterpolo Club. The perimeter wall around the waterpolo pitch has risen by seven courses high on one side, and on the other side up to 13, closing off this previously open coastal space. Access along the coastline by means of an existing route along the rocks, marked by a low staircase, has been bricked up. The sole purpose of these steps was to facilitate public passage along this part of the rocky beach, which is no longer possible in the same way. To reach Exiles Point the public is now forced to either double back or clamber over rough ground that can often be slippery or wet with sea spray at this time of year. Roman law, governing public ownership of the foreshore, sets the point at which building can begin as the furthermost point reached by breaking waves. If no other distance has ever been legally set, then this ancient ruling should still be in effect. The development of a sports club at Exiles falls within the category which normally calls for an environmental planning statement – an elementary type of environmental impact assessment. Yet, the application was exempted from the EIA process on grounds that the project description statement was expected to provide enough information. Could it be that not enough effort went into examining the social effect caused by loss of visual integrity brought about by the building if constructed as proposed? The planning authority’s policy of avoiding fragmented views is normally protected by a particular structure plan policy on the built environment (BEN 2). The North Harbours policy on coastal areas with leisure uses, under which Exiles falls, is crystal clear. It allows only “very minor extensions”, or those which do not exceed the height of an existing structure. North Harbour policy NHRL 03 section (c) specifically advises “no increase on solid structure” ...so that views are “not obstructed”. The statement that “the views from the lower playground are not going to be negatively affected” comes across as overly optimistic. No one has any argument with the waterpolo pitch, but not at the expense of spoiling Exiles with a visually intrusive building. The benefits of healthy sport to society are many. However, in this case it seems sport is being used as a lynchpin to flip planning policy. The case officer report openly admits that the development does not comply with the Structure Plan. Yet the case officer found nothing wrong with the proposal to demolish the existing structure and deemed the development “acceptable”, mainly because an outline development permit had preceded it in 2005, which was considered to “ameliorate” the existing complex. If one consults a thesaurus one finds that the planning term ‘ameliorate’ can mean any number of different things: restructure, revolutionise, remodel, reorganise, modernise, re­arrange, amend, upgrade, im­prove or make better. The present building might score eight out of 10 as “improve or make better”, but this hardly applies once a proposal is in breach of policy on grounds of visual disturbance in such a well-loved coastal setting. The much maligned wall has sliced a number of parking bays off the public parking area, and a payment was made to the Community Parking Payment Scheme… a fund meant for the building of more car parks. No site notices were in evidence until after an enforcement team from Mepa showed up on February 12 at the request of nearby residents. During the recent Force 10 gale, part of the wall was blown down and railings on the ramp for people with disability were damaged. Workers were on site and were reportedly engaged in removing danger to the public. Last Tuesday a truck crane showed up and observers believe the first phase of demolition – involving the removal of metal parts – are under way, despite a suspension order with respect to the 30-day period of grace pending a possible appeal. However, when contacted, a Mepa spokesman pointed out that the dismantling of metal sheets from the bar area does not require a Mepa permit. “It does not fall within the parameters of structural demolition works,” said public relations officer Peter Gingell. Yet in the eyes of all who know and love Exiles, planning policy on visual integrity has been swept aside by an extraneous leaning toward a sports club. This leaning assigns itself enough weight to blow down the planning authority’s own walls. If the 30-day time allowance elapses without an appeal having been submitted, then allegations of irregularities or policies ignored may be addressed to the Mepa audit officer. Both the Sliema local council and Malta Tourism Authority respectively have filed an objection and expressed their concern over the proposal.